Odoo CRM Scorecards make it easy — even fun — to create and track goals. That’s good because goals are important. You can’t really run a business without them. Clear, well-defined goals for individual employees and across the company at large present a baseline for any type of success. Goals also establish checkpoints by which we can evaluate our progress toward the finish line. In short, we are fans of goals. But it’s not always easy to set good goals, whether you’re talking about a single staff member or the path of a whole Fortune 500 company. Some goals might be too pessimistic, some overly optimistic. This is why, here at Blue Stingray, we take great care to set realistic goals that will help us get where we want. 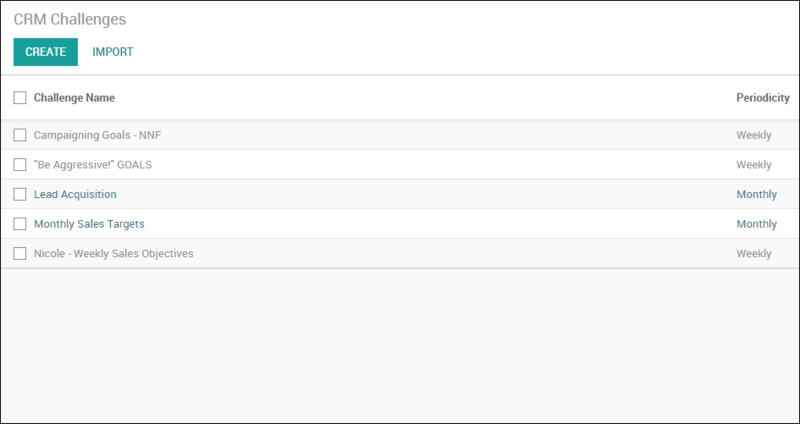 With the help of some cool technology like Odoo CRM Scorecards, this process actually becomes enjoyable! There, we said it. We love our in-house CRM. 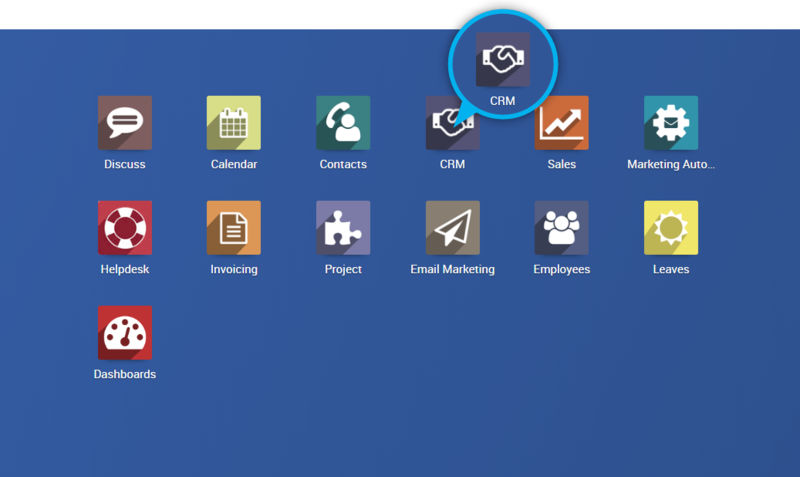 If you are looking at Odoo CRM right now, you won’t see the CRM Scorecards we use at Blue Stingray. This is because we took some liberties and created our own scorecard functionality. (After all, that’s what we do. Contact us if you want something similar for your business!) One reason we highly recommend open source platforms like Magento and Odoo is that they allow us to build any functionality into the system, fully tailoring the platform to your specific needs. 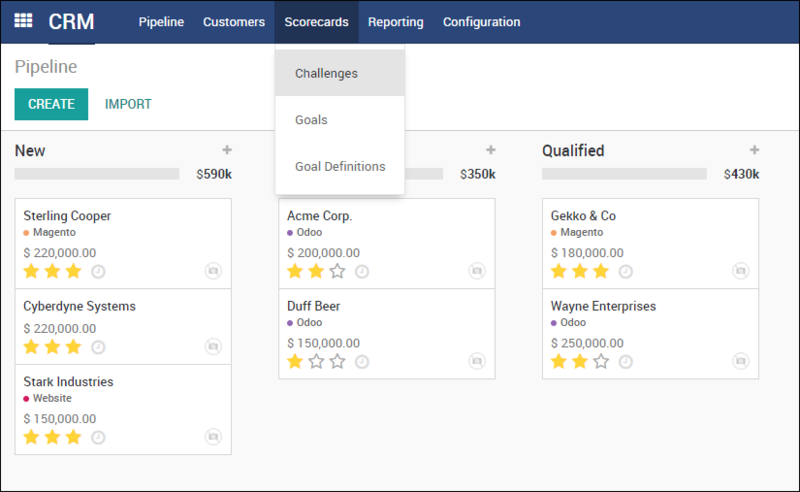 But let’s get to the point: Here’s how we set up our goals using Odoo CRM. As a first step, we create our challenge. From there, Odoo does the rest — it automatically starts creating goals based on the criteria we provide. The last screenshot above shows the list of challenges we already created, but if we click on one of those, we will see the criteria we used to create them. 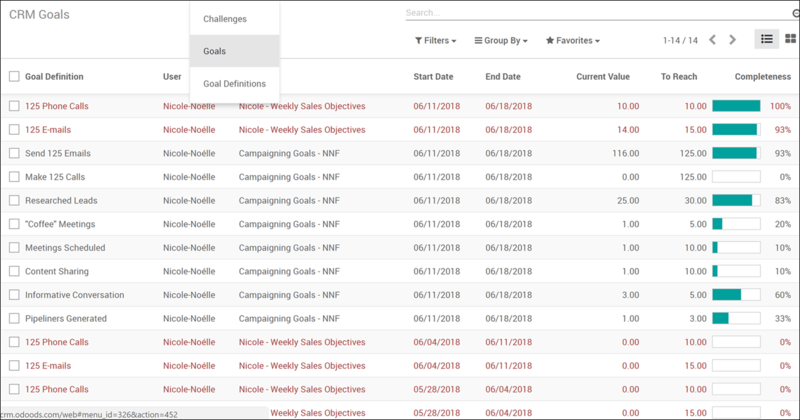 This is Nicole’s Weekly Sales Objectives challenge. As you can see, we specified goals that we want to be associated with this challenge (Phone Calls, Emails), how often we want the system to create these goals (Weekly), and what type of goals they are (Individual Goals or part of Leader Board/Group Ranking). Now that we have Challenges defined, we can go into Goals and see what the system created for us. Ta-da! As you can see from the above screenshot, Odoo created all of the associated weekly goals for us. There is even a little progress bar next to each goal that shows the percentage of our progress. Very handy! We can just navigate to this screen and immediately see goals that are on-target — and the ones that might need just a bit more attention. If you’re more of a visual learner, or you just need a quick snapshot of your work priorities, the Kanban view option is ideal for you. It provides quick, clean access to high-level information without focusing on too many details. This view is also helpful for when you’re looking for overall progress without getting into the granular details. Kanban view is also great for managers, for obvious reasons. So that’s the system we use to set up our goals here at Blue Stingray. It is easy, consistent, and fully automated. We don’t have to waste our time recreating the same goals again and again, week after week. Odoo does the busy work for us so we can focus on important things like adding other cool features to our ERP. Hey, that’s what us techies do — and Odoo is a true playground for ERP solutions. If you are interested in learning how this amazing software can help you simplify your goal setting process and improve your productivity, contact us at info@bluestingray.com for a free, no strings attached demo and we will show you why we are such raving fans of this system.